Peel wrote: I'm looking to read some good Justice League storylines that have been written in the past decade or just have more modern artwork. I've been buying all the main volumes for the New 52's Justice League which I really enjoy but am debating whether to buy some stories pre-new 52 as none of them really stood out to me that much, except for Tower of Babel and Identity Crisis, but they're pretty old. You should definitely give the Morrison JLA run a try although it was written in the 90s. 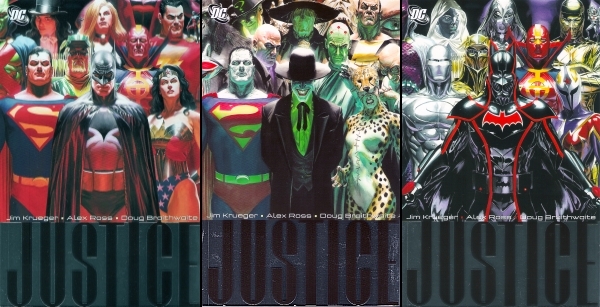 Justice by Alex Ross is worth a read, but its not in continuity. Two decades, but Kingdom Come. I tried getting into his run and read the story arc with Lex Luthor forming an Injustice Gang that consisted of him, Prometheus, The General and Queen Bee, but I really hated it because nothing substantially interesting happened, it went on for ages and I hated the artwork. Guess it was just not for me. I love Ross' artwork, I'll see if I can find a good deal on Amazon. I could never understand Kingdom Come by what I read about it online but it does look like a good story so I'll give it a try. So ever since playing the Arkham Knight Batgirl dlc, i have this strong interest in reading some batgirl and/or Batwoman comics. Are the new 52 batgirl comics any good, i saw the most recent one and they really throw me off with this brat like barbara that looks and acts like she is 16...when do the new 52 comics start with her being like that? What can you recommend me in terms of Batgirl stories and Batwoman? Last edited by Pieter on Aug 2nd, 2015, 9:15 pm, edited 1 time in total. Mani-Man wrote: So ever since playing the Arkham Knight Batgirl dlc, i have this strong interest in reading some batgirl and/or Batwoman comics. As Pieter said, Elegy and all of Batwoman's new 52 run up to 24 for her. After that, the series switches writers and goes into a massive nosedive with vampire softcore and hanging out in space with Clayface. The New 52 comics start with her being like that in issue 36. I was apprehensive about that soft reboot, but after reading it, it's actually pretty solid. The issue is that it comes after Simone's more mature version and it feels jarring put up against it. But on it's own terms, it's a good read and though the social media stuff can be grating at points, there ends up being a reason for it and they tone it back in a major way following the first arc. I get the feeling i will give the newer new 52 batgirl a chance sooner or later, maybe this teen barbara will warm up to me. I'm looking to get into reading some Azrael stories (In particular, just ones about the Michael Lane version, not the Jean-Paul Valley version) as I've really grown to like him as a Batman ally following his appearances in the Arkham. Are there any good standalone stories released in recent years that focus on him and perhaps have a good batman villain involved too? Any good under rated, lesser known batman stories preferably graphic novels recommendations for me? Peel wrote: I'm looking to get into reading some Azrael stories (In particular, just ones about the Michael Lane version, not the Jean-Paul Valley version) as I've really grown to like him as a Batman ally following his appearances in the Arkham. Are there any good standalone stories released in recent years that focus on him and perhaps have a good batman villain involved too? He had a mini which tied into Battle for the Cowl written by Fabien Nicieza, who then started an ongoing which was taken over by David Hine. Other than appearences in Batman Inc, i think thats your lot. I'll see if I can buy it on Amazon, thank you! Azrael Deaths: Dark Knight also looks really good and seems to be fairly new so I'll pick that up while I'm at it. To anyone who hasn't read Selina's Big Score, get it right now! It's the most amazing Catwoman story ever told! Last edited by batman404 on Nov 7th, 2015, 11:12 am, edited 2 times in total.